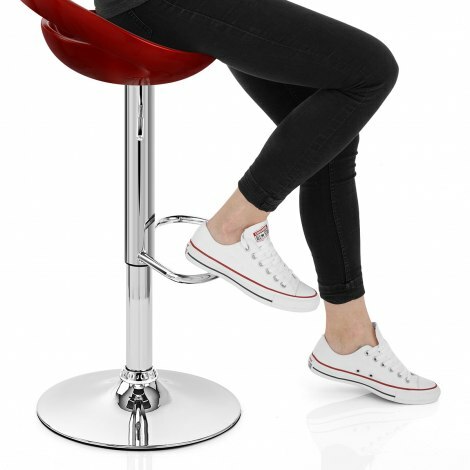 The Crescent Bar Stool Red is an eye-catching item of furniture, designed with style and ergonomic comfort. Keeping you satisfied for years to come, the Crescent will bring a modern vibrancy to any room it is placed in, from the kitchen to the breakfast bar. With a high gloss red metallic finish, the seat is made from ABS resin, and moulded for optimal comfort. It is also equipped with a comfortable backrest that provides good support for the lower back. Below the seat is a chrome column on which is a footrest made from chrome-plated steel. An adjustable height gas lift and 360 degree swivel mechanism is housed in the column, giving the Crescent added dynamics. A robust base ties up the package, with a rubber ring beneath that helps to protect your floor. "These stools were a great find"
Lovely looking chair that is easy to assemble and comfortable to sit on. Overjoyed with it for the price. Lovely product, look great in my kitchen. Easy to construct, good quality and came well packed and protected therefore no scratches etc. Very comfortable to sit on and stools fit neatly under kitchen work top. Very pleased with our purchase.